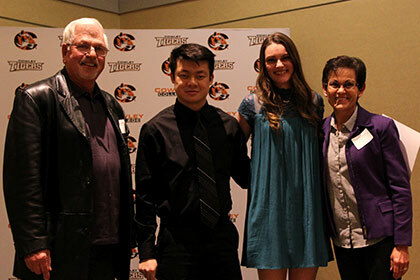 Click image for photo gallery of the Foundation Scholarship Reception. More than 100 individuals filled Cowley College’s Earle N. Wright Community Room Tuesday evening for the school’s seventh annual Foundation Scholarship Reception in which incoming students receiving endowed scholarships were brought together with the individuals who donated money to fund the scholarships. The event was sponsored through a generous gift from The Trust Company of Kansas. Cowley College’s Endowment Association awarded scholarships worth over $120,000 to students for the 2016-2017 academic year. Dr. Kori Gregg, vice president for institutional advancement, Lena Watkins, Foundation Coordinator, and Lisa Grose, scholarship coordinator, helped make the evening a success. While, Foundation Board president Mike Munson also helped with the event. Dr. Gregg served as the emcee for the evening. “This is a chance to honor our scholarship students who make outstanding contributions to our college and meet the incredible donors who make the scholarships available to them,” Dr. Gregg said. Several Cowley College Foundation Board members and school administrators were on hand to celebrate the students receiving scholarships. While, food and drinks were provided by Great Western Dining. Cowley College president Dr. Dennis C. Rittle told the students in attendance that it is nice to have donors that are investing in them.